Hydrating serum with hyaluronic acid protects, maintains, and preserves skin from damage caused by dryness. Moisture Booster hyaluronic acid + LSS™ delivery optimizes hydration by engaging with the skin’s natural production of hyaluronic acid. Our hyaluronic acid along with our trademarked LSS™ delivery makes it possible to create a bio-available environment, which increases a deeper penetration of our concentrated hyaluronic acid. Our technology is highly developed. 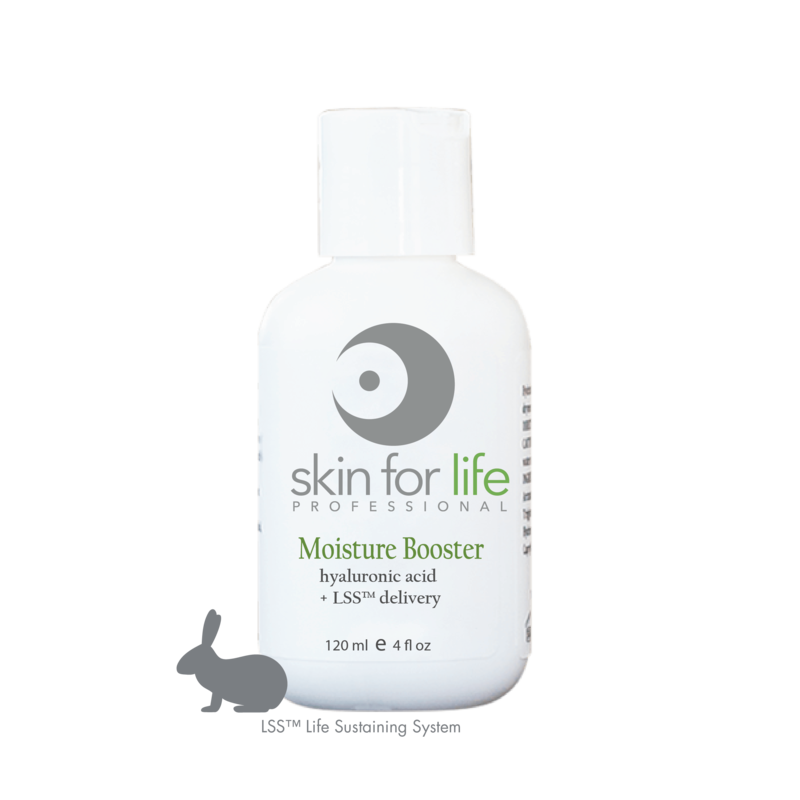 Moisture Booster provides the skin with extra moisture to protect skin from dehydration and dryness. Contributing factors of dehydration and dryness are climate, environmental disruptions and/or internal changes from the body. As we age, we lose up to 35% of our natural moisture factor. Moisture Booster maintains a balanced protection of extra moisture, used as prevention from external and internal factors. Skin for Life has incorporated antioxidants, brighteners, immunity peptides and amino acids to make a positive change to any skin type, color and/or condition. Moisture Booster is an antioxidant protection serum. There are three key ingredients that make this skin care product extremely beneficial for all skin. MAP “magnesium ascorbyl phosphate”. MAP protects the skin from free-radical damage. Free-radicals are increased by over exposure to sun, environmental pollutants and other daily stresses. MAP is high energy. Strengthens skin integrity and repairs cellular damage, while increasing cellular responses for a healthy skin lifestyle. Bearberry Leaf extract brightens skin by maintaining an anti-inflammatory response. This is important when treating difficult melasma, chloasma and hyper-pigmentation areas of concern. Due to our immunity driven skin care, our philosophy is always maintaining skin integrity while making a healthy skin change. This water attracting ingredient increases skin volume. It binds with other like hyaluronan or hyaluronate molecules with a viscous base. This allows molecules to stay connected while filling in the gaps of areas that lack water binding properties. Hyaluronic acid is the natural occurrence of water in skin. This extraordinary ingredient maintains vitality, vibrance and vivacity for youthful skin appearance. Hyaluronic acid is extremely necessary to prevent aging, dullness, and capillary distention. It is the necessary building block to hold the cellular structure of skin together. Moisture Booster is for all skin, oily, acne prone skin, aging, wrinkles, fine lines, age spots and much more. It is the universal product for all skin types, colors and conditions. Moisture Booster may be blended with Vita C Peptide Serum LSS™ delivery to increase skin performance when combating pigmentation discolorations, hyper-pigmentation, melasma or other sun related pigmented areas of concern. Use morning and night after toner and before moisturizer and/or sunscreen. Apply 1 – 2 pumps of Moisture Booster to face and neck. Blend well. Recommend Skin for Life’s cleansers, toners, moisturizers and sunscreens to prepare and complete home care routine for healthy skin results. Apply 1.25 ml – ¼ tsp amount of Moisture Booster hyaluronic acid + LSS™ delivery after thorough exfoliation treatment and before massage. Perform lifting massage movements with Moisture Booster hyaluronic acid + LSS™ delivery to face, neck and décolleté. Moisture Booster hyaluronic acid LSS™ delivery may be blended with Vita C Peptide Serum LSS™ delivery as an added booster of hydration, brighteners and antioxidants. Apply Moisture Booster hyaluronic acid + LSS™ delivery under Skin for Life’s performance masks for additional nutrients.